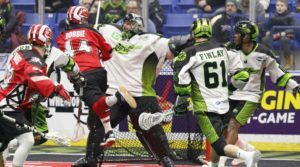 On Saturday February 9, a determined Calgary Roughnecks (5-4) team would string together three solid quarters to defeat the Saskatchewan Rush (3-4) on their home floor 17-12 Saturday night at the Sasktel Centre, making this the first win for Calgary in Saskatchewan. Early into the first Saskatchewan cashed in early on the power play; leading into a five two tilt for the Rush. Calgary was forced to play catch up lacrosse needed to pull it together to turn the season around. Scoring for Saskatchewan was Robert Church (3G, 1A); Ben McIntosh (1G, 1A); Ryan Keenan (2G, 2A); and Curtis Knight (2G). Roughnecks hitting net were Tyler Pace (4G, 3A); and Dane Dobbie (4G, 6A). The stingy Calgary defense tilted the scale in their favor with a three goal run in the second. The hard Calgary picks on the offense created scoring opportunities for Calgary. Dickson’s best offensive game this season with four goals and seven assist. The first Calgary power play in the second gave ‘Superman’ Curtis Dickson the hat trick near the end of the first half. The Roughnecks would see Dan Taylor (1G); Dickson (4G, 7A) with the hat-trick; and Dobbie with his second. Rush players putting points on the board were Jeff Shattler (3G, 1A); and Knight with his second. Tied at seven, the Roughnecks would take that momentum into the locker room to feed the winning hunger. “I think we’re swinging the ball really well, matching their intensity” said Calgary’s Dane Dobbie. “Stick with it, grind it out, grind it out, and grind it out”. Dobbie’s 10 point effort pushed him passed the 800 NLL career point milestone marker. Saskatchewan’s Nick Bilic ran over Calgary’s Zack Currier (1A) in the third in front of the penalty box, resulting in Bilic being ejected with a game misconduct penalty. On the Calgary bench Currier, under his own steam was escorted down the tunnel by team trainer to be assessed for a possible concussion that may have resulted from the collision and the cut on his nose from the impact. Calgary would dominate the third with Dan MacRae (1G, 1A); Riley Loewen (2G); Pace with his second; Dickson with his fourth; and Dobbie with his third for the hat-trick. The lone goal for the Rush would come with two seconds left in the frame as Church would score for the second time. Score at the end of three: Roughnecks 12—Rush 8. The Roughnecks would outscore the Rush five to four in the final frame. Scoring for Calgary would be Shattler; Dobbie; Loewen and Pace with two. Saskatchewan would notch four: Mark Matthews (1G, 3A); Shattler with the hat-trick; and Keenan with his second. “Massive win for us,” said Roughneck’s Curtis Dickson, who racked up 11 points (4 goals, 7 assists) on the night. Christian Del Bianco turned away 39 Saskatchewan scoring opportunities and added to the score sheet with one assist. The Roughnecks (5-4) road trip continues this weekend as they head east to face the Buffalo Bandits (7-2) on Saturday February 16, game time 7:30 p.m. EST. Saskatchewan (3-4) heads over to Vancouver to face the Warriors (3-6) also on February 16 with the late start, game time 10:00 p.m. EST.